American Eagle Systems has over 30 years of installation and relocation experience. AES has installed and relocated both mechanical and electrical assist mobile systems throughout the US. We are the only independent developer of electrical components for mobile systems, interfacing with many manufacturers, and therefore possess the installation expertise for most systems. We have helped install large projects here in the US, as well as in New Zealand, Europe, Australia and Canada. 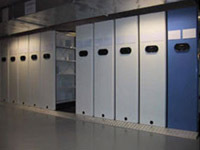 We install any type of racking that is used in combination with the mobile system, and can assist you in converting your mechanical carriages to an electrical assist system. AES has installed and re-located thousands of tape media storage racks by manufacturers such as EDP, NER, and Russ Bassett (GemTrac). 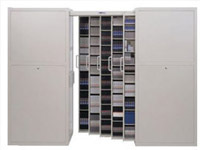 We also have the capability of moving and relocating the media stored within these rack systems. 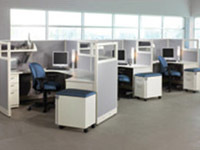 In many offices, there is a limited space for files or additional furniture. AES can offer space saving solutions, and can assist in both installing and relocating your shelving system, as well as the actual files themselves. Whether you are moving to another floor, across town, or across the country, AES has the personnel to make the transition seamless.